Background: Low digestibility of seed storage proteins (kafirins) and low nutritional grain value are one of the most important directions of genetic improvement of sorghum. In this review, we summarize experiments on improving protein digestibility, and increasing nutritional value of sorghum grain using genetic engineering approaches, primarily, by the introduction of genetic constructs that cause the silencing of γ- and/or α-kafirins. Key points of improvement of Agrobacterium-mediated genetic transformation, which was used for introduction of these genetic constructs in sorghum genome, are discussed. Transgenic sorghum harboring the genetic constructs inducing silencing of kafirins are characterized by reduction of kafirin oligomers, an increase of in vitro digestibility of proteins of flour, an increase in the proportion of essential amino acids, lysine, in particular, a changes in the ultrastructure of endosperm protein bodies (in case of α-kafirin silencing), which acquire an irregular shape with invaginations, and modification of endosperm texture, which become floury devoid of the vitreous layer. In some cases transgenic events with vitreous endosperm and high digestibility of kafirins were observed, which, in this connection, may be of interest for practical sorghum breeding. There are evidences that in vitro protein digestibility in transgenic plants with genetic construct for γ-kafirin silencing grown in the field plot was substantially lower than in the plants grown in the pots in greenhouse conditions. These facts indicate that suppression of the synthesis of kafirins occurring at epigenetic level as a result of the expression of the genetic constructs for silencing, is influenced by environment. In this connection, the use of methods of genome editing, in particular, editing the nucleotide sequences of the α- or γ-kafirin genes, opens wider prospects for improving the digestibility of kafirins and increasing the nutritional value of sorghum grain. Current approaches for biofortification of sorghum grain with amino acids and micronutrients are discussed. Global warming is one of the most serious problems that threaten the existence of mankind. The results of observations carried out in different countries clearly demonstrate the steady tendency to increase the average annual temperature on the Earth during the last 150 years.1 For example, in the Russian Federation, in the next 15years, in the summer season, the temperature will rise by 1.4-1.50C in all grain-producing regions.2 In the next 40years, depending on the rate of increase of the greenhouse effect, the temperature will rise by 2.0-3.30C. In this connection, the creation of heat-tolerant and drought-resistant varieties and hybrids, the introduction of drought-resistant crops into agricultural production become extremely urgent problems of genetics and plant breeding. Improving the kafirins digestibility and increasing the nutritional value of sorghum grains is possible with the help of different genomic and biotechnology tools that target introduction of novel genetic variation leading towards impaired synthesis or modified amino acid composition of kafirins.12,13; identification of natural allelic variants of kafirins4,14–16; increasing the lysine content of sorghum grain by introducing genetic constructs encoding lysine-rich proteins17 or suppressing synthesis of the enzyme catabolizing lysine (lysine ketoglutarate reductase); the introduction of genetic constructs that cause the silencing of γ- and/or α-kafirins genes.18–21; editing nucleotide sequences of γ and/or α-kafirin genes for the purpose of knockout.22 In this review, we summarized the published reports on improving the digestibility of kafirins and increasing the nutritional value of sorghum grains using genetic engineering approaches and outlined their importance for practical sorghum breeding. The use of biotechnological tools to address the problem of improving the digestibility of kafirins requires reliable methods of introducing genetic constructs into genome of different of sorghum lines and reliable methods of plant regeneration from transformed cells. In spite of numerous reports on obtaining transgenic sorghum plants by using microbombardment technique, Agrobacterium-mediated genetic transformation, pollen-mediated transformation, genetic transformation of sorghum for a long time was a serious problem (see reviews).23–25 However, as a result of intensive research in recent years, significant progress has been made in this area. To date, the methods of introducing transgenes into the genome of sorghum, both by microprojectile transformation26,27, and through Agrobacterium-mediated genetic transformation28–31 were significantly improved. In addition, in our early studies on the development of methods for obtaining callus cultures with high and stable regeneration capacity from mature sorghum embryos, a high efficiency of a nutrient medium containing a combination of 2,4-D and 6-BAP was shown.35 Efficiency of the medium with this combination of phytohormones to increase the frequency of transgenic plants in experiments on Agrobacterium-mediated genetic transformation has been clearly demonstrated.29 In this regard, one should mention the report on significant stimulation of callus induction from immature sorghum embryos and plant regeneration by lipoic acid that allowed obtaining high transformation frequency (27.2%) in particle bombardment experiments.27 Positive effect of lipoic acid might be caused by its anti-oxidative capacity that is important for in vitro cultured sorghum embryos. In addition, a lot of other factors were reported to affect successful genetic transformation of sorghum using A. tumefaciens. Among them are addition of poly (vynilpolypirrolidone) (PVPP) or anti-oxidants (L-cystein or ascorbic acid) into the co-cultivation medium to reduce toxic pigment production by sorghum tissues damaged by agrobacterial cells that is used in numerous reports; cold pretreatment of immature seeds used for isolation of embryos;40 heat pretreatment of immature embryos;38 addition of surfactants like Pluronic F-6843 or Silwet-7031 facilitating transfer of T-DNA in cultivated cells; growing conditions of plants-donors of immature embryos and agrobacterial cells, activation of vir-genes, and some others. Recently, it has been demonstrated that the use of vectors containing the genes of the morphogenetic regulators Baby boom (Bbm) and Wuschel(Wus) significantly increases the frequency of transgenic plants in a number of cereal species, including sorghum.45,46 Moreover, the inclusion in the genetic construct the Cre recombinase gene under the control of a promoter sensitive to desiccation stress in tissue culture and loxP sites flanking the Bbm and Wus genes makes it possible to produce transgenic plants bearing only the target gene and not containing the Bbm, Wus and Cre. This finding opens wide prospects for the genetic transformation of sorghum in a variety of ways, including improving the nutritional value of this crop. To overcome the problems associated with agrobacterial transformation under in vitro culture conditions, we proposed a method for producing transgenic sorghum plants in planta by inoculating flowering panicles with a suspension of agrobacterial cells with activated vir-genes.47 In that work we used plants of CMS-line which were pollinated by the pollen of its fertile counterpart and then were inoculated by agrobacterial cells. Using this method, we obtained transgenic plants which inherited transgene (nptII) in T1 generation. An important point in this method is the need for observing the temperature regime: the plants should be incubated after inoculation under temperature conditions optimal for agrobacterial transformation, i.e. at 23-25°C. Although, later on, we applied this method for fertile sorghum lines and also obtained transgenic plants, which inherited nptII up to T2 generation, this method requires additional elaboration because of poor reproducibility of the results. Recently, Visarada et al.48 modified procedure for inoculating flowering panicles and obtained transgenic sorghum plants, which inherited transgene (cry1Aa) up to T4 generation. Yelisetty et al.49 suggested another in planta method for genetic transformation of sorghum, by inoculation of the meristematic region of 2-days old germinating seedlings with A. tumefaciens cell suspension. Transformation efficiencies ranged between 34-38% and 26-34% for different vectors and genetic constructs. This method seems to be quite promising; nevertheless it needs additional verification and replication in other laboratories. In recent years, RNA interference technology has been intensively used to suppress the synthesis of seed storage proteins in different species of cereals including wheat,50–55 rice56–58 and maize59–63. These experiments contributed to obtaining new information on the mechanisms of protein body formation, as well as the role of various classes of prolamins and glutenins in the development of endosperm and the technological properties of flour and dough. For example, in maize, use of genetic constructs containing inverted repeats of α-zein genes (19kDa and 22kDa), allowed to obtain transgenic lines with suppressed synthesis of these proteins.59,60 It has been found that suppression of the synthesis of zeins having a relatively low nutritional value, leads to the accumulation of other proteins with a higher nutritional value. Maize plants with silencing of α-zeins were characterized by a doubled content of essential amino acids - tryptophan and lysine - in their kernels. In these experiments, it was found that silencing the 22kDa α-zein gene resulted in the formation of a floury endosperm. Such a change of the endosperm type was associated with a change in the structure of the protein bodies, namely, with a disturbed incorporation of 19kDa α-zein into the center of the protein body or a change in its interaction with β- and γ-zein. In the QPM (quality protein maize) lines having vitreous endosperm, various mutants with variations in the structure of protein bodies and endosperm types were obtained by introducing the genetic constructs for RNAi silencing of different zein gene.61,62 It has been demonstrated that an important role in the formation of floury endosperm plays silencing of the γ-zein gene, as a result of which the structure of protein bodies and their connection with starch granules changes.62 In a detailed study it was shown that 27-kDa γ-zein causes initiation of protein bodies.63 Other proteins belonging to the γ-zein family function at the stage of proliferation of protein bodies. Suppression of both 19- and 22-kDa α-zeins significantly suppresses the proliferation of protein bodies, but does not cause their morphological anomalies that arise in the case of reduction of only 22kDa α-zein. Simultaneous suppression of all zein classes leads to a decrease in the number of protein bodies, which in this case have a normal size and morphology. Intensive studies have been undertaken by several research groups on the induction of RNA-silencing of the kafirin genes in sorghum. The main goal of these experiments was the creation of sorghum lines with improved kafirin digestibility. RNA-silencing was induced by genetic constructs carrying inverted repeats of several kafirin genes (α1, δ2, γ1, γ2), separated by the sequence of the intron of the ADH1 gene; these constructs were driven by the maize 19-kDa α-zein promoter.18,64 In another study,19 a genetic construct was used to induce the silencing of the γ-kafirin, which included the complete sequence of the γ-kafirin gene under the control of the γ-kafirin promoter. The sequence of the self-cleaving ribozyme gene of the tobacco mosaic virus was used as a terminator, which expression should destroy γ-kafirin mRNA. To induce the silencing of α-kafirin, a construct consisting of inverted repeats of α-kafirin separated by the sequence of the intron of the arabidopsis gene encoding the D1 spliceosome protein was used; this construct was driven by the α-kafirin promoter.19 Later, transgenic sorghum lines with another complex RNAi construct which should suppress synthesis of γ1-, γ2-, and δ-kafirins were also obtained.20 In the experiments of each of these groups, lines of transgenic sorghum with suppressed synthesis of γ- and/or α-kafirins and a floury type of endosperm were obtained. Unfortunately, the presence of floury endosperm is a disadvantage of these lines, since the absence of a vitreous layer increases the fragility of the grain and reduces their resistance to damage by the fungal diseases. 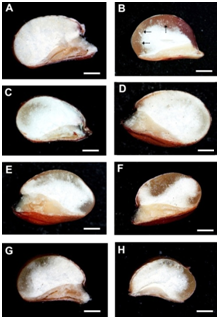 Figure 1 Cross-sections of kernels of transgenic sorghum plants with genetic construct for silencing of the γ-kafirin gene.66 A – kernel with floury endosperm set on the plant from Т3 generation; B – kernel of original non-transgenic line Zheltozernoe 10 with thick vitreous endosperm (marked by arrows); C, D, E - modified endosperm type with blurs and sectors of vitreous endosperm observed in kernels of different T1 and T2 plants, F, G, H – irregularly developed vitreous endosperm developed in kernels of T2 and T3 plants. Bar = 1 mm. The most important effect of kafirins silencing is the increase protein digestibility in both cooked and raw sorghum flour. For example, transgenic plants of Tx430 carrying genetic construct for silencing of several kafirin sub-classes (α- and γ-kafirin silencing) were characterized by improved in vitro protein digestibility of both raw and cooked grain flour: 78 and 61%, respectively; whereas in non-transgenic control these figures were 40-50% and 34-40%, respectively).68 Genetic construct for silencing only δ- and γ-kafirins also caused improvement of in vitro protein digestibility of raw flour but did not affected digestibility of cooked flour.68 In experiments of Kumar et al.19, cooked flour obtained from transgenic plants carrying genetic constructs for silencing of γ-kafirin did not differ from non-transgenic control, whereas silencing of α-kafirin improved in vitro protein digestibility of cooked flour. Transgenic plants obtained in our experiments also had significantly improved in vitro digestibility of endosperm storage proteins.21 Examples of improved in vitro protein digestibility are presented in Figures 2 & 3. Comparison of electrophoretic spectra before and after pepsin digestion of proteins of T1 plant #94-2 (almost floury endosperm; Figure 2A, lanes 1, 2) with Zh10 kernels (Figure 2A, lanes 5, 6) revealed that in transgenic plant the amount of undigested α-kafirin monomers and total undigested protein was significantly fewer (in 1.7-1.9times, according to quantitative analysis of SDS-PAGE images) than in original non-transgenic line.66The digestibility value reached 85.4%, whereas in original line this value was about 60% (Table 1). Remarkably, in kernels of transgenic plant #94-3-08 (T2 generation) with thick vitreous endosperm (Figure 2A, lanes 3, 4), the differences in kafirin digestion were more pronounced: the amount of undigested monomers was 17.5 times fewer, and the amount of total undigested protein was 4.7 times fewer than in original line. The digestibility value reached 92% (Table 1). Figure 2 SDS-PAGE of endosperm proteins of kernels developed on transgenic sorghum plants with genetic construct for silencing of the γ-kafirin gene in reducing conditions.66 SDS-PAGE was carried out in 13.0% (w/v) PAG according to modified Laemmli method; in each lane, 20.7 μL of extract obtained from equal amount of flour (20mg) was loaded. The gels were stained with Coomassie Brilliant Blue R-250.A: 1, 2 – plant from T1 generation (#94-2) with almost floury endosperm; 3, 4 – plant from T2 generation (#94-3-8) with thick vitreous endosperm; 5, 6 – original non-transgenic line Zheltozernoe 10 (Zh10) with normal vitreous endosperm; M – molecular weight markers. 1, 3, 5 – before, and 2, 4, 6 – after pepsin digestion. Dashed arrows indicate probable kafirin oligomers. α-kafirin monomers are indicated by brace. B: 1 - 4 – two plants (#94-2-04 and #94-2-05) from the progeny of #94-2, both with modified endosperm; 5, 6 – plant with floury endosperm (#94-2-11) from the same progeny; 7, 8 – original non-transgenic line Zh10. 1, 3, 5, 7 – before, and 2, 4, 6, 8 – after pepsin digestion. Each value is a mean from two replications. Data followed by the same letter did not differ significantly (P<0.05) from plant from the same group of families according to Duncan Multiple Range Test. Protein digestibility was calculated as percent ratio of difference between total estimated protein quantity in the control and digested sample to total estimated protein quantity in the control sample. 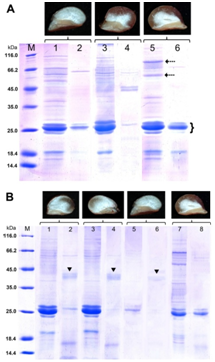 Figure 3 SDS-PAGE of endosperm proteins of kernels of transgenic sorghum plants from T3 families #94-2-11 (with modified endosperm) (A) and #94-3-08 (with vitreous endosperm) (B) in reducing conditions.66 SDS-PAGE was carried out in 13.0% (w/v) PAG according to modified Laemmli method; in each lane, 20.7 μL of extract obtained from equal amount of flour (20mg) was loaded. 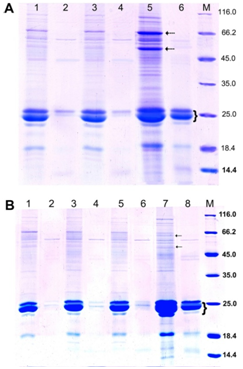 The gels were stained with Coomassie Brilliant Blue R-250.A: 1-4 two individual transgenic plants, 5, 6 – original non-transgenic line Zh10; М – molecular weight markers (kDa). Dashed arrows indicate fraction of kafirin oligomers; brace – α-kafirin monomers. 1, 3, 5 – control samples; 2, 4, 6 – samples after pepsin digestion. B: 1-6 – three individual transgenic plants, 7, 8 – original non-transgenic line Zh10. 1, 3, 5, 7 – before, 2, 4, 6, 8 – after pepsin digestion. In our studies, in the kernels of transgenic plants from the T2 generation with high in vitro protein digestibility, both with modified endosperm and with vitreous endosperm, total amino acid content was significantly reduced for 22.8-40.2%, in comparison with the original non-transgenic line.21 At the same time, the relative content of two major essential amino acids, lysine and threonine, significantly increased. Lysine proportion increased by 1.6-1.7times: from 1.54% of total amino acid content in the flour of original non-transgenic line to 2.41-2.63% in transgenic plants.21 Such increase of the relative content of lysine and threonine in transgenic sorghum plants, coupled with a significant reduction of the total level of amino acids, presumably was caused by decrease in the content of α-kafirins poor in lysine and threonine, whereas the synthesis of other proteins remained undisturbed. Accordingly, the relative proportions of lysine and threonine increased. The lower α-kafirins content in transgenic plants relative to the original non-transgenic line is clearly evident in the above electrophoresis photographs (Figure 2 & Figure 3). Perhaps the suppression of the synthesis of γ-kafirin prevents the accumulation of α-kafirins, but does not affect the synthesis of other proteins richer in lysine and threonine. Such a rebalancing of seed proteome is a common phenomenon for transgenic plants with genetic constructs for RNA-silencing of major seed storage proteins. For maize, it was suggested that developing kernels possess compensatory mechanisms that sense protein content when zein synthesis is interrupted, leading to translation of other mRNAs instead of zein mRNAs.72 This involves an intracellular signal transduction to attain a predetermined protein level. Remarkably, in knockdown mutant lines of soybean with suppressed synthesis of major storage proteins, the seeds maintained nearly identical levels of total protein compared to the untransformed soybean cultivars.73 These data suggest that proteome rebalancing in seeds might be a rather common event, providing a constant sink for reduced nitrogen during seed maturation. The above examples of suppressing the synthesis of kafirins through the introduction of genetic constructs for RNA-silencing is performed by small interfering RNAs (siRNAs) and subsequent mRNA cleavage and translational inhibition, which are important epigenetic mechanisms in plants. However, epigenetic mechanisms in plants are known to be sensitive to growing conditions, to environmental factors (temperature, soil moisture and air, etc.). There are reports that temperature can have a major impact on the extent of gene silencing.75 Small interfering RNAs (siRNAs) and microRNAs (miRNAs) are key regulators of posttranscriptional gene silencing that includes mRNA cleavage and translational inhibition. Recently it has been shown that miRNA-mediated mRNA cleavage and translational inhibition are dependent on plant growth temperature.76 Therefore, the effectiveness of suppression of kafirin synthesis by RNA-silencing constructs might be sensitive to environmental conditions. Indeed, in our experiments, in vitro protein digestibility in transgenic plants with genetic construct for γ-kafirin silencing grown in the field plots was substantially lower than in the plants grown in the pots in greenhouse.69 In this regard, induction of mutations that disrupt functioning of the kafirin genes at the genetic level may be a more effective approach for altering the level of kafirins. Recently, using CRISPR/Cas9 gene editing approach Li and co-workers22 induced mutations in a conserved region encoding the endoplasmic reticulum signal peptide of α-kafirins. The target site mutations occurring in each k1C gene include small deletions ranging in length between 1 and 33 bp, as well as a low frequency of small insertions of 1 to 16bp. T1 and T2 seeds showed reduced α-kafirin levels, altered protein body microstructure, and selected T2 events showed significantly increased grain protein digestibility and lysine content. This work opens new perspectives in improvement of nutritional value of sorghum grain using biotechnological approaches. Numerous researches published up to date clearly demonstrate that genetic engineering techniques are quite promising for enrichment of cereal grain with essential amino acids, i.e. lysine, tryptophan, methionine, and micronutrients. By using endosperm-specific promoters, expression of the desired genes may be provided exactly in the kernels, rather than in somatic tissues where the increased content of these amino acids may lead to developmental abnormalities.77 The gene encoding high lysine analog (HTl2 protein) of Hordeum vulgare α-hordothionin protein under the control of the 27kDa maize γ-zein promoter and terminator was introduced in genome of two sorghum lines, P898012 and PHI391, by using Agrobacterium-mediated genetic transformation.17 The A. tumefaciens strain (LBA4404) contained "super-binary" vector with two unlinked T-DNA cassettes: one cassette contained the lysine-rich HTl2 gene and another contained a herbicide-resistant bar gene as a selectable marker, under the control of maize ubiquitin promoter. This co-transformation vector with two different T-DNA cassettes permits the segregation of the marker gene from the trait gene in the progeny of the primary transformants that is important to elimination of the marker gene and obtaining marker-free transgenic plants. Of five independent transgenic events that were co-transformed with both genes, three expressed high levels of the HTl2 protein in the grain, with a 40-60% increase of lysine. Sorghum contains very low levels of β-carotene (provitamin A), which is highly important for human health. In order to increase β-carotene content in sorghum grain and ensure its stability during grain storage, the work was carried out on the introduction into the genome of sorghum line (Tx430) the genetic constructs encoding a number of enzymes involved in the carotenoid biosynthesis pathway.78 These enzymes are: 1-deoxyxylulose 5-phosphate synthase (DXS),the precursor for carotenoid biosynthesis, Zea mays phytoene synthase 1 (PSY1) and the Pantoeaananatis carotene desaturase (CRTI), involved in synthesis of phytoene and lycopene, respectively, which are the β-carotene precursors (Figure 4). These gene significantly increased β-carotene level in mature seeds of transgenic plants (up to 9.1μg/g vs. 0.5 μg/g in non-transgenic control seeds), although did not prevent its degradation during storage as a consequence of its oxidation. 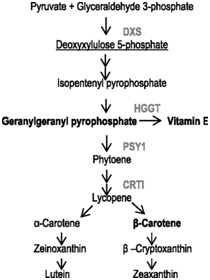 To prevent in planta degradation of β-carotene, the barley HGGT gene encoding homogentisate geranylgeranyl transferase, involved in synthesis of the vitamin E, which has strong antioxidant effect, was introduced into the same genetic construct. It was found that that co-expression of HGGT, stacked with carotenoid biosynthesis genes, enhanced all-trans β-carotene accumulation in the range of 7.3–12.3μg/g and mitigate β-carotene oxidative degradation, resulting in enhanced stability of provitamin A in sorghum seeds. This research is a shining example of the effectiveness of the genetic engineering approach for modifying plant metabolism to meet human needs. It is able to make an impact on millions of people who suffer from vitamin A deficiency. Intensive development of methods of genetic transformation allowed creating transgenic sorghum lines carrying specially designed genetic constructs, purposely suppressing the synthesis of endosperm storage proteins - kafirins. Transgenic lines with suppressed kafirin synthesis are characterized by increased digestibility of endosperm proteins and increased content of lysine, and, thus, come close to solving the problem of improving the nutritional value of the grain of this crop. The kernels of transgenic lines with α-kafirin silencing had soft floury endosperm type that prevents their direct commercial use; however these lines may be used as donors of this trait in crosses with sorghum lines adopted to local environments for improvement of their nutritive value. The kernels of transgenic lines with γ-kafirin silencing may have hard vitreous endosperm or modified endosperm having sectors of vitreous endosperm. This fact indicates the possibility of obtaining agronomically valuable sorghum lines with high digestibility of kafirins and hard endosperm, although the lines with γ-kafirin silencing have lower level of in vitro protein digestibility than the lines with α-kafirin silencing. No significant changes in anti-nutritional factors (tannin and phytate content) were detected in transgenic lines with γ-kafirin silencing.74 In addition to the improvement of sorghum protein digestibility, the genetic engineering approaches allowed to increase essential amino acid content, particular lysine, by introducing the genes encoding high-lysine protein, and increase the level of A-provitamin in sorghum grain and bioavailability of micronutrients. However, strict regulations that govern practical usage of these innovations prevent their entering in the market. For until the world regulatory agencies establish guidelines that are science based, that focus on the trait, not the process by which that trait is generated, most valuable technologies will never see the light of day. The work has been partially supported by Russian Foundation for Basic Research, project no 16-04-01131. Hansen J, Sato M, Ruedy R, et al. Global temperature change. Proc Natl Acad Sci USA. 2006;103:14288–14293. Voeikov Main Geophysical Observatory. The Federal State Budgetary Institution. 2018. Rakshit S, Hariprasanna K, Gomashe S, et al. Changes in area, yield gains, and yield stability of sorghum in major sorghum-producing countries, 1970 to 2009. Crop Sci. 2014;54:1571–1584. Duodu KG, Taylor JRN, Belton PS, et al. Factors affecting sorghum protein digestibility. J Cereal Sci. 2003;38(2):117–131. Belton PS, Delgadillo I, Halford NG, et al. Kafirin structure and functionality. J Cereal Sci. 2006;44(3):272–286. De Mesa-Stonestreet NJ, Alavi S, Bean SR. Sorghum proteins: the concentration, isolation, modification, and food applications of kafirins. J Food Sci. 2010;75(5):90–104. Wu Y, Yuan L, Guo X, et al. Mutation in the seed storage protein kafirin creates a high-value food trait in sorghum. Nat Commun. 2013;4:2217. Mohan DP. Chemically Induced High-Lysine Mutant in Sorghum bicolor (L.) Moench. PhD Thesis. Purdue University, 1975, West Lafayette, IN, USA. Mehlo L, Mbambo Z, Bado S, et al. Induced protein polymorphisms and nutritional quality of gamma irradiation mutants of sorghum. Mutation Res. 2013;749(1-2):66–72. Laidlaw H, Mace E, Williams S, et al. Allelic variation of the beta-, gamma- and delta-kafirin genes in diverse Sorghum genotypes. TheorAppl Genet. 2010;121(7):1227−1237. Cremer JE, Bean SR, Tilley MM, et al. Grain Sorghum Proteomics: Integrated Approach toward Characterization of Endosperm Storage Proteins in Kafirin Allelic Variants. J Agric Food Chem. 2014;62:9819−9831. Chiquito-Almanza E, Ochoa-Zarzosa A, Lуpez-Meza JE, et al. A new allele of γ-kafirin gene coding for a protein with high lysine content in Mexican white sorghum germplasm. J Sci Food Agric. 2016;96(10):3342−3350. Da Silva LS, Taylor J, Taylor JR. Transgenic sorghum with altered kafirin synthesis: kafirin solubility, polymerization, and protein digestion. J Agric Food Chem. 2011;59(17):9265–9270. Kumar T, Dweikat I, Sato S, et al. Modulation of kernel storage proteins in grain sorghum (Sorghum bicolor (L.) Moench). Plant Biotechnol J. 2012;10(5):533–544. Grootboom AW, Mkhonza NL, Mbambo Z, et al. Co-suppression of synthesis of major α-kafirin sub-class together with γ-kafirin-1 and γ-kafirin-2 required for substantially improved protein digestibility in transgenic sorghum. Plant Cell Rep. 2014;33(3):521–537. Elkonin LA, Italianskaya JV, Domanina IV, et al. Transgenic Sorghum with Improved Digestibility of Storage Proteins Obtained by Agrobacterium-mediated Transformation. Russ J Plant Physiol. 2016;63(5):678–689. Li A, Jia S, Yobi A, et al. Editing of an alpha-kafirin gene family increases digestibility and protein quality in sorghum. Plant Physiology. 2018;177(4):1425–1438. Girijashankar V, Swathisree V. Genetic transformation of Sorghum bicolor. Physiol Mol Biol Plants. 2009;15(4):287–302. Saikishore N, Visarada KBRS, Rao SV, et al. Progress and Prospects for Agrobacterium-Mediated Genetic Transformation in Sorghum in Comparison to Other Cereals. Transgenic Plant J. 2011;5(1):27–34. Do PT, Zhang ZJ. Sorghum transformation: achievements, challenges, and perspectives. In: Azhakanandam K, Silverstone A, et al. editors. Recent advancements in gene expression and enabling technologies in crop plants. New York, Heidelberg, Dordrecht, London: Springer; 2015. p. 291–312. Liu G, Godwin ID. Highly efficient sorghum transformation. Plant Cell Rep. 2012;31(6):999–1007. Belide S, Vanhercke T, Petrie JR, et al. Robust genetic transformation of sorghum (Sorghum bicolor ) using differentiating embryogenic callus induced from immature embryos. Plant Methods. 2017;13:109. Wu E, Lenderts B, Glassman K, et al. Optimized Agrobacterium-mediated sorghum transformation protocol and molecular data of transgenic sorghum plants. In Vitro Cell Dev Biol Plant. 2014;50(1):9–18. Do PT, Lee H, Mookkan M, et al. Rapid and efficient Agrobacterium-mediated transformation of sorghum (Sorghum bicolor) employing standard binary vectors and bar gene as a selectable marker. Plant Cell Rep. 2016;35(10):2065–2076. Che P, Anand A, Wu E, et al. Developing a flexible, high-efficiency Agrobacterium-mediated sorghum transformation system with broad application. Plant Biotechnology J. 2018;16(7):1388–1395. Elkonin LA, Pakhomova NV. Influence of nitrogen and phosphorus on induction embryogenic callus of sorghum. Plant Cell Tissue Organ Cult. 2000;61(2):115–123. Raghuwanshi A, Birch RG. Genetic transformation of sweet sorghum. Plant Cell Rep. 2010;29(9):997–1005. Nirwan RS, Kothari SL. High copper levels improve callus induction and plant regeneration in Sorghum bicolor (L.) Moench. In Vitro Cell Dev Biol Plant. 2003;39(2):161–164. Elkonin LA, Papzyan ND, Sukhanov VM, et al. Somatic Sorghum Tissue Culture. Phytohormonal regulation of morphogenesis. Sov Plant Physiol. 1986;33:504–512. Elkonin LA, Italianskaya JV, Barankova IV, et al. Agrobacterium-mediated genetic transformation of sorghum in in planta and in vitro conditions and obtaining of transgenic plants with modified composition of seed storage proteins. In: X International Conference "Plant Cell Biology in Vitro and Biotechnology. 2013 October 14-18; Kazan, Russia. 2013. P. 265. Gao Z, Xie X, Ling Y, et al. Agrobacterium tumefaciens-mediated sorghum transformation using a mannose selection system. Plant Biotech J. 2005;3(6):591–599. Gurel S, Gurel E, Kaur R, et al. Efficient, reproducible Agrobacterium-mediated transformation of sorghum using heat treatment of immature embryos. Plant Cell Rep. 2009;28(3):429–444. Hill-Ambroz KL, Weeks JT. Comparison of constitutive promoters for sorghum transformation. Cereal Res Commun. 2001;29:17–24. Nguyen TV, Thu TT, Claeys M, et al. Agrobacterium-mediated transformation of sorghum (Sorghum bicolor (L.) Moench) using an improved in vitro regeneration system. Plant Cell Tiss Organ Cult. 2007;91(2):155–164. Visarada KBRS, Padmaja PG, Saikishore N, et al. Production and evaluation of transgenic sorghum for resistance to stem borer. In Vitro Cell Dev Biol-Plant. 2014;50(2):176–189. Kumar V, Campbell LM, Rathore KS. Rapid recovery and characterization of transformants following Agrobacterium-mediated T-DNA transfer to sorghum. Plant Cell Tiss Organ Cult. 2011;104(2):137–146. Carvalho CHS, Zehr UB, Gunaratna N, et al. Agrobacterium-mediated transformation of sorghum: factors that affect transformation efficiency. Genet Mol Biol. 2004;27(2):259–269. Emani C, Sunilkumar G, Rathore KS. Transgene silencing and reactivation in sorghum. Plant Sci. 2002;162(2):181–192. Lowe K, Wu E, Wang N, et al. Morphogenic regulators Baby boom and Wuschel improve monocot transformation Plant Cell. 2016;28(9):1998–2015. Mookkan M, Nelson-Vasilchik K, Hague J, et al. Selectable marker independent transformation of recalcitrant maize inbred B73 and sorghum P898012 mediated by morphogenic regulators BABY BOOM and WUSCHEL2. Plant Cell Rep. 2017;36(9):1477–1491. Elkonin LA, Ravin NV, Leshko EV, et al. Agrobacterial transformation of sorghum plants in in planta Biotechnology. 2009;(1):23–30. Visarada KBRS, Prasad GS, Royer M. Genetic transformation and evaluation of two sweet sorghum genotypes for resistance to spotted stem borer, Chilopartellus (Swinhoe). Plant Biotechnol Rep. 2016;10(5):277–289. Yellisetty V, Reddy LA, Mandapaka M. In planta transformation of sorghum (Sorghum bicolor (L.) Moench) using TPS1 gene for enhancing tolerance to abiotic stresses. J Genet. 2015;94(3):425–434. Gil-Humanes J, Piston F, Hernando A, et al. Silencing of γ-gliadins by RNA interference (RNAi) in bread wheat. J Cereal Sci. 2008;48(3):565–568. Gil-Humanes J, Piston F, Gimenez MJ, et al. The introgression of RNAi silencing of γ-gliadins into commercial lines of bread wheat changes the mixing and technological properties of the dough. PLoS ONE. 2012;7(9):e45937. Wieser H, Koehler P, Folck A, et al. Characterization of wheat with strongly reduced α-gliadin content, In: Lookhart GL, Ng, PKW, editors. 9th Annual Gluten Workshop, 14-16 September, 2006, San Fransisco, California, USA / AACC, St Paul, MN, p. 13–16. Altenbach SB, Tanaka CK, Allen PV. Quantitative proteomic analysis of wheat grain proteins reveals differential effects of silencing of omega-5 gliadin genes in transgenic lines. J Cereal Sci. 2014;59(2):118–125. Gil-Humanes J, Pistón F, Tollefsen S, et al. Effective shutdown in the expression of celiac disease-related wheat gliadin T-cell epitopes by RNA interference. Proc Natl AcadSci USA. 2010;107(39):17023–17028. Nagamine A, Matsusaka H, Ushijima T, et al. A role for the cysteine-rich 10 kDaprolamin in protein body I formation in rice. Plant Cell Physiol. 2011;52(6):1003–1016. Kim HJ, Lee JY, Yoon UH, et al. Effects of reduced prolamine on seed storage protein composition and the nutritional quality of rice. Int J Mol Sci. 2013;14(8):17073–17084. Kawakatsu T, Hirose S, Yasuda H, et al. Reducing rice seed storage protein accumulation leads to changes in nutrient quality and storage organelle formation. Plant Physiol. 2010;154(4):1842–1854. Segal G, Song R, Messing J. A new opaque variant of maize by a single dominant RNA-interference-inducing transgene. 2003;165(1):387–397. Guo X, Yuan L, Chen H, et al. Non-redundant function of zeins and their correct stoichiometric ratio drive protein body formation in maize endosperm. Plant Physiol. 2013;162(3):1359–1369. Elkonin LA, Italyanskaya JV, Panin VM, et al. Development of Transgenic Sorghum Plants with Improved In Vitro Kafirin Digestibility. In: Jurić S, editor. Plant Engineering. Zagreb (Chroatia): InTech, 2017;91–112. Tesso T, Ejeta G, Chandrashekar A, et al. A novel modified endosperm texture in a mutant high-protein digestibility/high-lysine grain sorghum (Sorghum bicolor (L.) Moench). Cereal Chem. 2006;83(2):194–201. Da Silva LS. Transgenic sorghum: Effects of altered kafirin synthesis on kafirinpolymerisation, protein quality, protein body structure and endosperm texture. PhD Thesis. Department of Food Science, Faculty of Natural and Agricultural Sciences, Univ. Pretoria, South Africa. 2012. Weaver CA, Hamaker BR, Axtell JD. Discovery of grain sorghum germplasm with high uncooked and cooked in vitro protein digestibility. Cereal Chem. 1998;75:665–670. Elkonin LA, Italyanskaya YV. In vitro digestibility of storage endosperm proteins of transgenic sorghum plants carrying genetic construct for silencing of the gamma-kafirin gene. Adv Curr Nat Sci. 2017;12:96–100. Wu Y, Messing J. Proteome balancing of the maize seed for higher nutritional value. Front Plant Sci. 2014;5:240. Schmidt MA, Barbazuk WB, Sandford M, et al. Silencing of soybean seed storage proteins results in a rebalanced protein composition preserving seed protein content without major collateral changes in the metabolome and transcriptome. Plant Physiol. 2011;156(1):330–345. Ndimba RJ, Kruger J, Mehlo L, et al. A Comparative Study of Selected Physical and Biochemical Traits of Wild-Type and Transgenic Sorghum to Reveal Differences Relevant to Grain Quality. Front Plant Sci. 2017;8:952. Tuttle JR, Idris AM, Brown JK, et al. Geminivirus-Mediated Gene Silencing from Cotton Leaf Crumple Virus Is Enhanced by Low Temperature in Cotton. Plant Physiol. 2008;148(1):41–50. von Born P, Bernardo-Faura M, Rubio-Somoza I. An artificial miRNA system reveals that relative contribution of translational inhibition to miRNA-mediated regulation depends on environmental and developmental factors in Arabidopsis thaliana. PLoS ONE. 2018;13(2):e0192984. Ufaz S, Galili G. Improving the content of essential amino acids in crop plants: goals and opportunities. Plant Physiol. 2008;147(3):954–961. Che P, Zhao Z-Y, Glassman K, et al. Elevated vitamin E content improves all-trans beta-carotene accumulation and stability in biofortified sorghum. Proc Natl Acad Sci USA. 2016;113(39):11040–11045. Vashishth A, Ram S, Beniwal V. Cereal phytases and their importance in improvement of micronutrients bioavailability. 3 Biotech. 2017;7(1):42. Reddy CS, Kim SC, Kaul T. Genetically modified phytase crops role in sustainable plant and animal nutrition and ecological development: a review. 3 Biotech. 2017;7(3):195. Kruger J, Taylor JRN, Du X, et al. Effect of phytate reduction of sorghum, through genetic modification, on iron and zinc availability as assessed by an in vitrodialysabilitybioaccessibility assay, Caco-2 cell uptake assay, and suckling rat pup absorption model. Food Chem. 2013;141(2):1019–1025. ©2018 Elkonin et al. This is an open access article distributed under the terms of the Creative Commons Attribution License , which permits unrestricted use, distribution, and build upon your work non-commercially.